Tonight could have easily gone wrong quickly for the Warriors; eventually, it did, but not until until late. 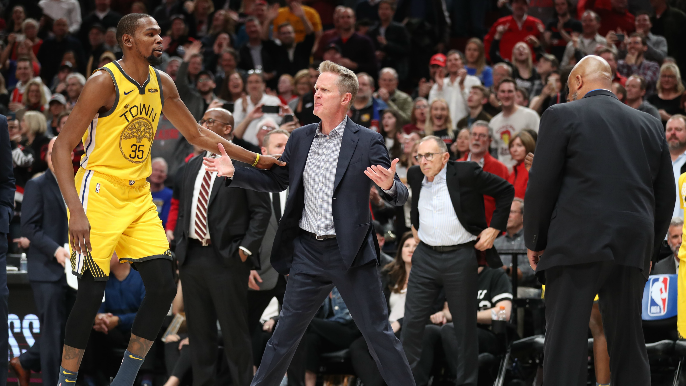 With DeMarcus Cousins, Andre Iguodala and Shaun Livingston all sitting versus a dominant home team in the Portland Trail Blazers on the Warriors’ second night of a back-to-back, there was every indication that the Warriors needed to be perfect, or near it. Tonight, the Warriors rested three of the key cogs in their rotation for the Warriors’ final game before the All-Star break. DeMarcus Cousins, Andre Iguodala and Shaun Livingston all left the Warriors depleted of some reinforcements which would have been greatly appreciated tonight. Still, the decision protected two older players and one who came back from a catastrophic injury. It also opened up minutes for the likes of Alfonzo McKinnie, Damion Lee, Jonas Jerebko and Jordan Bell. As Portugal. The Man, a Portland rock group sang on “Evil Friends,” “And if I get some rest, yeah, that’d be nice.” Aside from Curry, Durant and Thompson, the Warriors’ will get a full week off for All-Star Weekend. Without three key players tonight, you knew Durant and Curry (and/or Klay Thompson) would have to be at their best to give the Warriors a shot at winning. While Thompson struggled mightily (2-of-16, 9 points), Durant and Curry were near perfect. For the first time in their times as teammates, or their “teammateship,” if you will, both Curry and Durant scored 30-plus points each through the third quarter. Everything fell apart in the fourth quarter, but that was a product of the Blazers getting hot, and that flagrant foul of Green effectively ending the night with four minutes left. It didn’t help that no one else on the team scored in double digits.